Indigenous grape varieties and unique terroir! 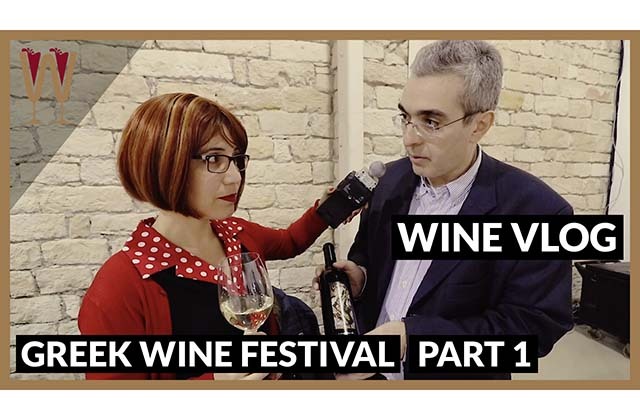 WineScribble visits the Peloponnese Wine Festival, at the Carob Mill in Limassol, to taste select wines made of rare, ancient Greek grape varieties. We connected with winemakers from the Peloponnese in Greece, but also with important wine personalities based on the island of Cyprus. Enjoy! Hey Tasters! Today I’m in Limassol. 23 leading Peloponnese winemakers have organized a tasting event. More than 200 wines from the Peloponnese, I can’t wait. Come with me! So this is the Fileri from the estate Panagiotopoulos. Fileri, it’s, the wineries located in Trifylia that’s in Messinia, of the western Peloponnese. The grape variety is Fileri, it’s an indigenous variety to our region so you won’t find it in other areas. This is from the 2018 vintage. Normally it’s a wine that we ferment and mature in stainless steel tanks and usually has fresh aromas. Nice citrus notes with a nice crisp mouthfeel. It’s very aromatic guys, it’s a beautiful white wine there’s a lot of floral aromas, a lot of stone fruit, like pears. And absolutely beautiful I think. What would you pair this with? What would you serve this with? Salads or fish of course. If you come to Messinia and Kalamata, we have very nice fish there and very nice agricultural products that you could pair with like tomatoes, all kinds of salads. The Malagousia, again from Panagiotopoulos estate. This is our favourite white wine. Malagousia, it’s an indigenous variety to Greece, very aromatic. And I believe that ours apart from the nice nose that one expects from Malagaousia has also very nice and a very round mouthfeel. So we’re very happy with his wine. Is this fermented in steel tanks? Again, this is also fermented only in stainless steel tank and matured in stainless tanks. We do some battonage, some sur lie ageing in the tanks. So, and I think that that’s the reason that it has a nicer mouthfeel versus other Malagousia wines that you can find. This is divine, this is absolutely beautiful. Very, very aromatic. Beautiful floral aromas, beautiful fruit, very vibrant. Refreshing acidity, I could taste this all day long. Cheers! This is Marcos Zambartas. Marcos Zambartas is one of the up-and-coming wine makers of Cyprus. He is an expert in grape varieties and I’ve just run into him. And all I want to ask you Marcos is, which grape variety of the ones you’ve tasted here today is your favourite? I really preferred the Moschofilero, the white wines of the Peloponnese. Really fragrant aromas, really expressive and very clean wines. It’s it’s a very easygoing light white. Yes, not all of them are I would consider them you know easygoing and the acidity is very refreshing. And quite remarkable that Greece can have wine with such high acidity other than Assyrtiko. The floral aroma doesn’t make them necessarily very fruit friendly, but there are some examples that they are very fruit friendly and I think in general we’re going to see much better wines as time passes. There’s great potential there. Thank you very much. This is Mr. Marcos Zambartas everyone. Thank you! Hi, my name is Charis Tselepos, I’m with Ktima Tselepos. We are situated in Mantineia, which is the place that Moschofilero wine is mainly produced. And we also have wine producing in the Nemea region with Agiorgitiko grapes, and we also make wine in Santorini, mainly Assyrtiko. Today you will taste Blanc de Gris which is a wine made from Moschofilero. We make two kinds of two different types of Moschofilero. One which is more aromatic, lighter, crispier, and one that’s more full-bodied which is the one that you will taste now. So this wine is made from 100% Moschofilero grapes. It’s mostly fermented in big oak tanks and it’s aged for a few months in big used oak barrels. And nowadays we experiment a bit with this wine. A percentage of it is is fermented in these oak tanks and percentages in eggs, and amphoras. So, yeah it’s a mix of different fermentation techniques, and we try to make the best wine possible. Do the grapes macerate with the skins because I can see this is a darker colour than most whites. Is that from the ageing or the maceration? Mostly, the colour comes from the ageing because it’s, in the… The fermentation happens in the wooden tanks, but it’s also four to six months in 500 litre barrels. It goes well with seafood for me. Seafood fish would be a really good pairing for this wine. I think he it would take fatty seafood like salmon and prawns. Yeah, exactly some fish with sauces would do a real good pairing for this wine. Hey Tasters! This is Bill Warry, he’s one of the biggest wine bloggers on the island of Cyprus. He also has a wine tours business. This man loves wine, this man understands wine, and I really want to ask him… Bill you’ve tasted the wines here today what’s your favourite Greek grape variety? Well, what I have found that really excited me today is actually originally from Italy but brought to Greece, and is a blend quite often you get very nice blends. And here we had an 80% Refosco with 20% Mavrodaphne. It was exquisite! The most marvellous pairing that I can think of with Stifado. Stifado guys is a stew, loads of onions. A Greek beef stew as Greeks know how to make stew. Absolutely! And it’s the orange zest that makes the difference. Cheers Bill! My pleasure. I’m Panayiotis Papagianopoulos from Tetramythos organic winery from the north part of Peloponnese. We are in the village of Ano Diakopto. We cultivated only organic vineyards, and you are going to taste Tetramythos Roditis Natur. It’s a natural wine with AOC indication Patras, from the vineyards of 2017. Wild fermented with a spontaneous malolactic fermentation. It’s rich in floral and lemon blossoms aromas, with a very creamy and savoury taste. This is a beautiful wine guys. It’s full-bodied for a white. Very full-bodied and citrus blossoms, a really refreshing acidity. What would you pair with this? Well it’s ideal for feta cheese, the Greek pies with the herbs, and fight as well. Its ideal food pairing with seafood starting from the small fried fishes, and going up to the oysters and generally shellfish, because it has a very nice salty finishing in the mouthfeel. This has the lemony and the salty character, so it’s ideal for fish food pairing. It’s absolutely lovely and he’s right there is a little bit of salty air in this this tastes like grace this tastes like the perfect wine to pair with anything you’d get in a Greek, in a Greek tavern. Cheers! This is Alexandros Alexandrou, one of the biggest wine lovers on the island. He’s very prolific on social media, look him up. He is qualified by his passion for Cyprus wine and Greek wine. So, Alexandros, you’re here at the Peloponnese festival, could you please tell me… of all the Peloponnese wine grape varieties you’ve tried, which one is your favourite? Well, obviously there’s only one that stands out, and that is Agiorgitiko. Agiorgitiko is Peloponnese wine, that’s it! Why do you like Agiorgitiko? Because, first of all it’s medium in tannins, it’s not very tannic wine and apart from that, I personally believe that it’s even better than Xinomavro. A lot of people will disagree with me, but my personal opinion is that Agiorgitiko is better Xinomavro. It is the best wine in the Peloponnese and maybe entire Greece. You don’t go to Alexandros for half-measures guys! So there you go. Strong statements, from a strong man, about the strong wine. Thank you very much for your time! Hey guys, I’ve had an amazing time here at the Peloponnese Wine festival. Also, I’ve been introduced to grape varieties I never knew before. I have met wine makers. I’ve met wine lovers. And, I have so much footage I’m going to have to make two videos. The second part of this video will be coming to you soon, so stay tuned. If you’ve enjoyed this video leave me a thumbs up, subscribe, share this video with a friend. Cheers everyone!